Jaipur, March 22: The BrahMos supersonic cruise missile was successfully flight tested from Rajasthan's Pokhran test range on Thursday morning. As per reports, the missile flies almost three times the speed of sound at Mach 2.8 and has a range of 290 km with supersonic speed all throughout the flight, leading to shorter flight time. To recall, the BrahMos was inducted into the Navy and Army in 2006. It can fly at 2.8 times the speed of sound, is the fastest cruise missile of its class. 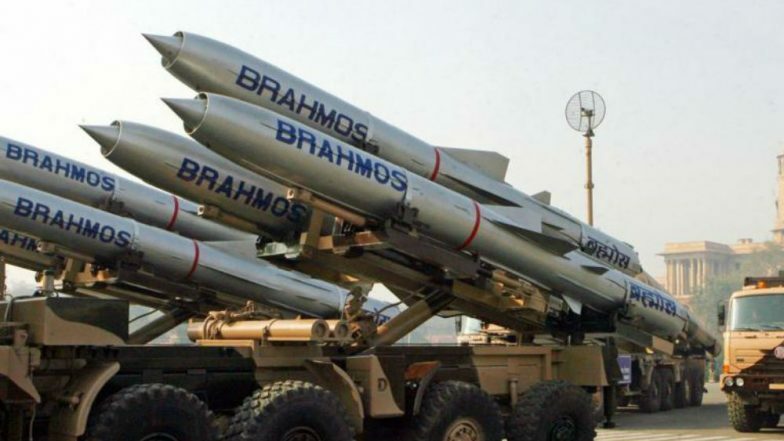 The BrahMos, a medium range ramjet supersonic cruise missile has been jointly developed with Russia and is named for the rivers Brahmaputra of India and the Moskva of Russia. The range of the BrahMos missile can be extended up to 400 km as certain technical restrictions were lifted after India became a full member of the Missile Technology Control Regime or MTCR in 2016. It must be noted that the BrahMos missile has three times more velocity as compared to other cruise missiles, 2.5 to 3 times more flight range, 3-4 times more seeker range and nine times more kinetic energy. The missile weighs between 2,500 kg and 3,000 kg, has a length of about 8.4 meters with a warhead of about 200-300 kg. As per reports by NDTV, the air-launched variant of the BrahMos was successfully test fired from a Sukhoi-30 combat jet on November 22. This marked a major milestone to enhance the precision strike capability of the air force. Reports state that the project is expected to be completed by 2020. In 2017, the BrahMos was showcased at the Dubai Air Show. It had garnered quite a lot of interest from several countries. As per reports by Business Line, Praveen Pathak, general manager of BrahMos, had said that representatives from Brazil, Indonesia and 12 other nations visited the stall and enquired about the missile.